Earlier this year our Clerk advised the Historical Committee that he had been contacted by a Mr Tim Oliver owner of Hampden House a historic building near Great Missenden Buckinghamshire and with connections to Oliver Cromwell. Mr Oliver had bid at an auction in the West Country for a file of papers concerning Cromwell. 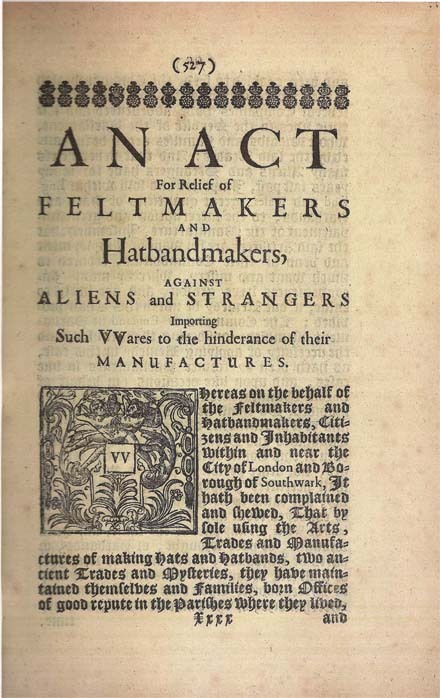 In the papers he discovered an original document, the 1649 Act for Relief of Feltmakers and Hatbandmakers, which he very kindly donated to the Feltmakers Company. He has received our grateful thanks for his generosity. The document has been lodged in the Company’s Archives at the Guildhall and two photocopies retained by the Historical Committee. Copies of the cover and first page of the Act accompany this report and it can be seen immediately that the script is beautifully crafted whilst the content is greatly detailed and no words are spared to make a point! Click on each image to see a larger size version. The Act then goes into great detail as to how and by whom seizure of imported goods would be carried out. Basically the proceeds of goods so seized would be divided half to the poor of the parish and the other half to the seizer. 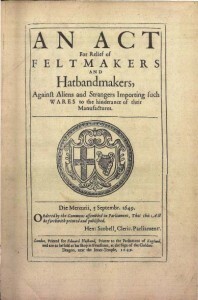 Among those authorised to search and seize it was ordained “that the said several Masters, Wardens and Assistants of the said Trades and Mysteries of the Hatmakers, or Feltmakers, and Hatbandmakers of the said City of London”, could be appointed by Justices of the Peace to make search for such prohibited wares. 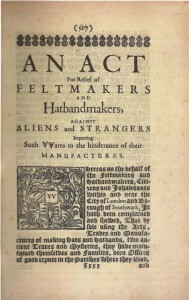 The appeal clearly impressed the Commons assembled in Parliament as an Act was granted for one year and ordered to be printed and published “Die Mercurii, 5 Septembr,1649”. Our Clerk reported that 1649 was a historic year with the formation of the Commonwealth Protectorate following the execution of Charles 1st on 30th January1649. Our Act must have been one of their earliest pieces of legislation.